› Author AffiliationsThe authors thank the National Basic Research Program of China (973 Program, 2015CB931804), the National Natural Science Foundation of China (No. 81473076 and 81673292) and the Science and Technology Commission of Shanghai Municipality (No 15431900100) for financial support. 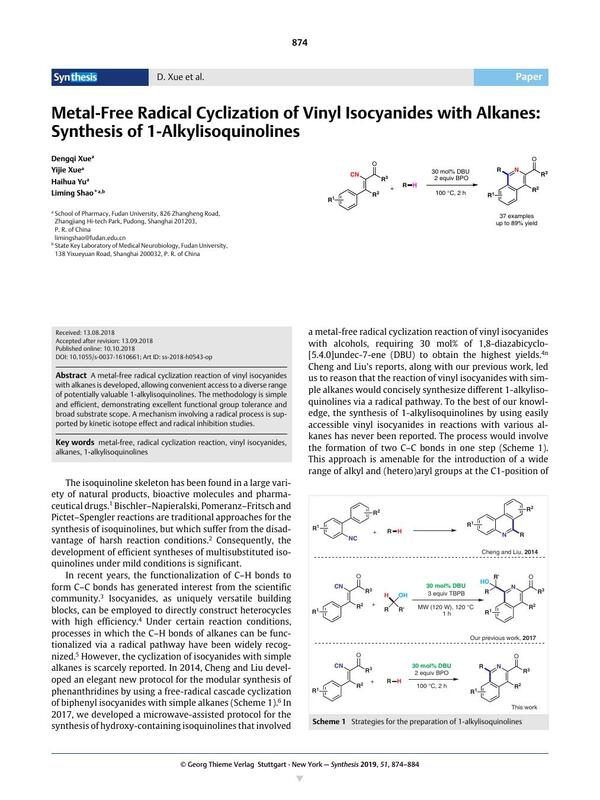 A metal-free radical cyclization reaction of vinyl isocyanides with alkanes is developed, allowing convenient access to a diverse range of potentially valuable 1-alkylisoquinolines. The methodology is simple and efficient, demonstrating excellent functional group tolerance and broad substrate scope. A mechanism involving a radical process is supported by kinetic isotope effect and radical inhibition studies. Supporting information for this article is available online at https://doi.org/10.1055/s-0037-1610661.